The side profile does have the SUV like boxy styling, but the low stance makes it seem more like a crossover. The wheel arches are muscular and squarish. The door pillars are blacked out and there are roof rails too. The alloy wheels fill the arches well and they do not appear to be empty at any point. There are clean lines that run across the SUV. The rear styling of this new SUV also melds well with its overall design. The tail lamps are neatly integrated and they do look stylish. There is an integrated rear spoiler and reflectors in the bumper. The overall styling is just impressive and even the paint quality makes it feel premium.The Compass doesn’t seem to look very tall and its design will somewhat appear like a crossover. So, we aren’t certain on what will a buyer’s reaction to this design. The Jeep Compass India production will actually make it easier for the company to enhance their sales numbers as the pricing should be highly competitive. The interiors of the Jeep Compass aren’t very swanky and lavish. The dashboard is simple yet functional having a dual tone treatment. You’ve got a chunky three-spoke steering wheel with audio controls but there are some dummy buttons for the cruise control, which is not being offered in India. The instrument cluster looks premium having a huge MID in the middle and is easy to read. There is a neatly integrated touchscreen infotainment system. The user interface looks good but the touch quality is just average. Jeep offers Apple CarPlay and Android Auto for smartphone connectivity. The sound quality of the audio system is rich and quite satisfying. Some of the features missing in the Compass are sunroof, electrically adjustable seats, auto headlamps, auto wipers, etc. 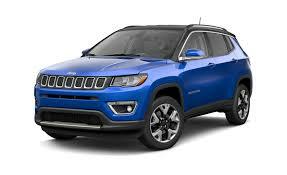 The ingress and egress is quite comfortable in the Jeep Compass and you don’t feel like you are sitting in a hatchback like other compact SUVs, it is relatively high and you have a commanding driving position with a good view all around. The quality, fit and finish is nice and you can hardly find any cheap quality panels inside the cabin. The seats are very comfortable and supportive, there is ample legroom and headroom at the back. Even the under-thigh support of the seats are pretty good. The boot is also well spaced out and can accommodate a lot of luggage. The Jeep Compass gets disc brakes at front as well as rear. The SUV comes with as many as 50 safety and security features in form of Four-channel Anti-lock Brakes, full-function Traction Control, Electronic Stability Control, Panic Brake Assist, Hydraulic Boost Failure Compensation, Electronic Roll Mitigation etc. Additionally, the company has incorporated 6 Airbags (side curtains for front and rear-passengers), Electronic Parking Brake (EPB) and Reverse Parking Camera to further strengthen the safety of the occupants. The Compass is a seriously impressive SUV that seems to take full advantage of Jeep’s experience with SUVs. In fact, look deep into its headlights, past that seven-slot grille, and you can see the years and years of know-how shining through. Prices for the Compass diesel start at a very competitive Rs 15.45 lakh (ex showroom Delhi), with this top-of-the-line Limited (O) 4 X 4 going for Rs 20.65 lakh. What you get for your money is real off-road ability, strong dynamics and plenty of luxury and comfort on the inside. Sure, the touchscreen isn’t really what’s expected of a car in this class and there are important bits of kit missing, like a sunroof; and those interested will have to contend with Fiat’s less-than-fantastic dealer network. Rear seat comfort could have been better for this segment, and those looking for a diesel automatic SUV will be disappointed as the Compass will get that only at a later stage. But this SUV’s fundamentals are so strong, it’s difficult not to compare it to cars from a class above, like the Volkswagen Tiguan which is a lot more expensive at where it stands today. And that’s the real kicker – the Compass may just be the value luxury SUV you have been waiting for. This entry was posted in Auto by admin. Bookmark the permalink.